I was pleasantly surprised a couple weeks ago to get a phone call from my 16 year old niece, Amanda – “Hey Uncle Scott, could you teach me to make a sock monkey?” You bet! 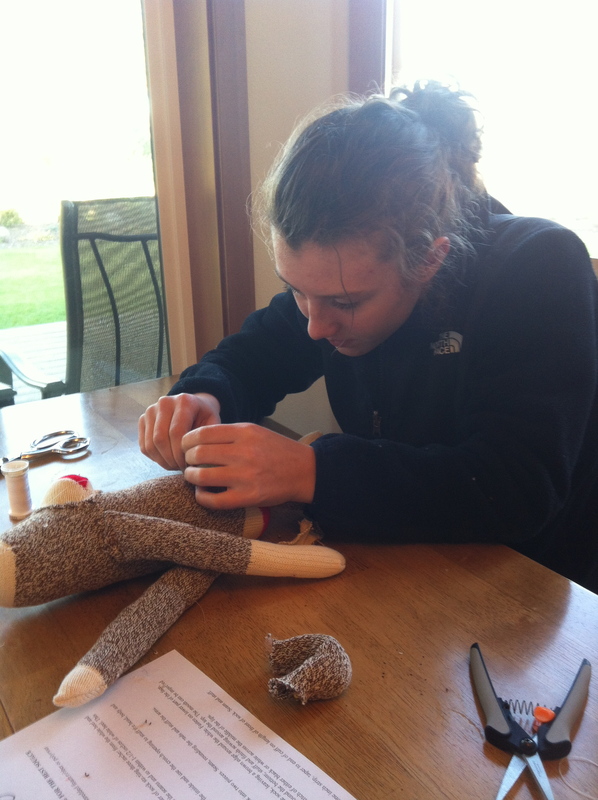 The following week the kids were on an early release from school, and along with a request to join us from niece Emily, I hauled sewing machine and supplies down to their house and the three of us sat down for an afternoon of sock monkey making. 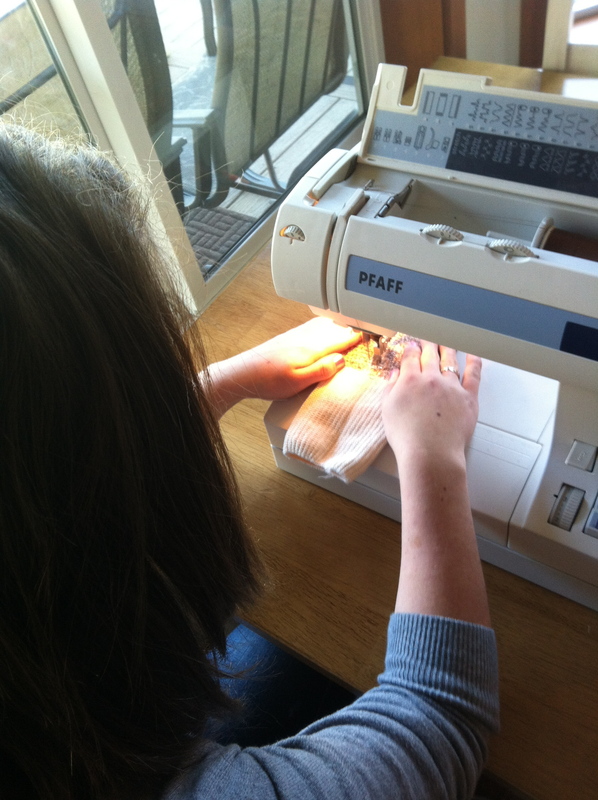 What a great time we had – the kids just dove right into the project and got to work. I tend to overthink and complicate things and often get a little obsessed with minute details of “perfection.” This tends to slow me down, so it was great to watch the kids zip through it and see that I could take a cue from them on speed and efficiency. Emily is a bit like me in that she was trying to do things “perfectly”, while Amanda just watched what I did, then did it herself and said “Do you mean like this?”. Uh, yeah, that’s actually exactly what I wanted you to do – and this from the girl who said she wasn’t sure she could really make one. I realized by watching the girls work that I like the way they put the mouths lower on their monkeys than I’ve been doing – when I got home I moved the mouths lower on two monkeys in progress and think they look a lot better. So here are the results of our afternoon’s effort – I love the crooked smile that Emily’s monkey has and the cute ears Amanda made fore hers. Unfortunately, I forgot to include my box of vintage buttons in the supply bag, so we just stuck a couple of straight pins in for eyes so we could get a picture, and we all liked the result – maybe I’ll do a monkey in the future with round beads for eyes? By the end of the afternoon we had discussed the possibility that more sock monkeys might get made as Christmas presents for the girls’ school friends – and who doesn’t love a hand-crafted Christmas gift? 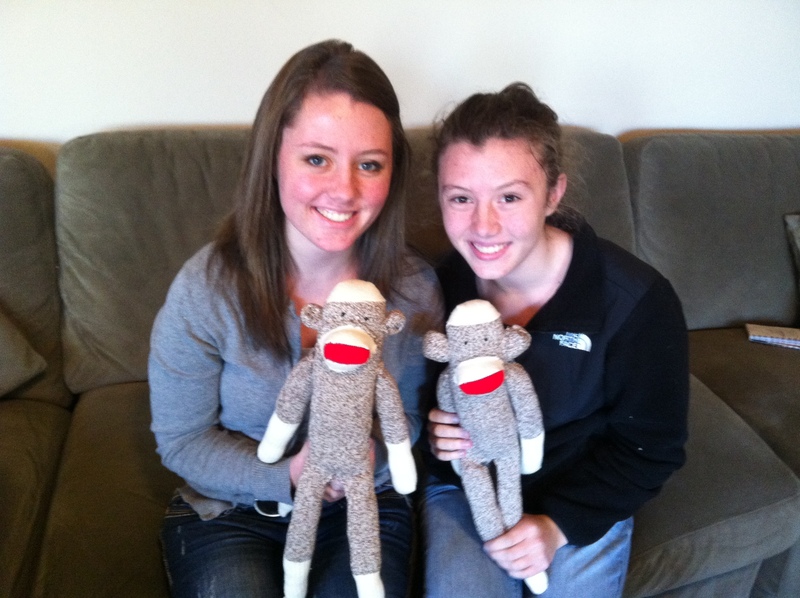 Amanda and Emily with their finished sock monkeys! This entry was posted on November 16, 2011 by scootrah. It was filed under Uncategorized .